Speed Reading is a utility to help you read and comprehend text quickly. Type or paste any text you want to the main text window. 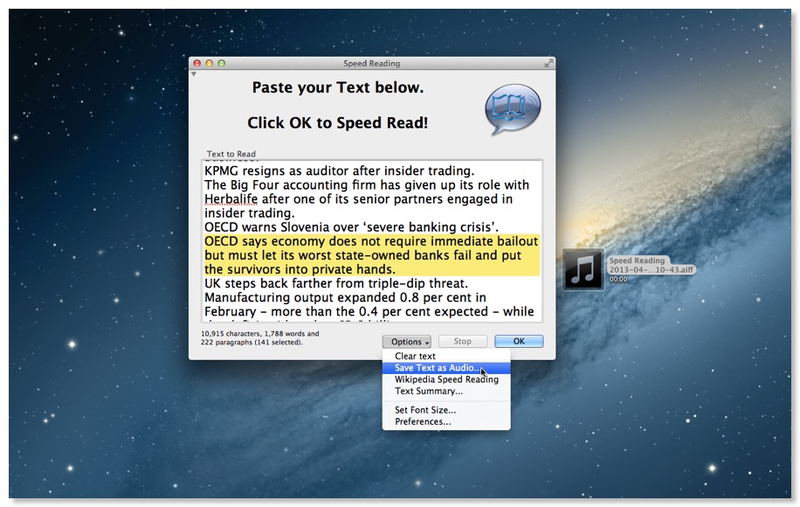 Click the OK button to have Speed Reading read the text to you Word-by-Word (or by Line, Sentence or Paragraph), highlighting and speaking each word. Speed Reading automatically takes any text on the clipboard, pastes it into the main window then speaks that text. 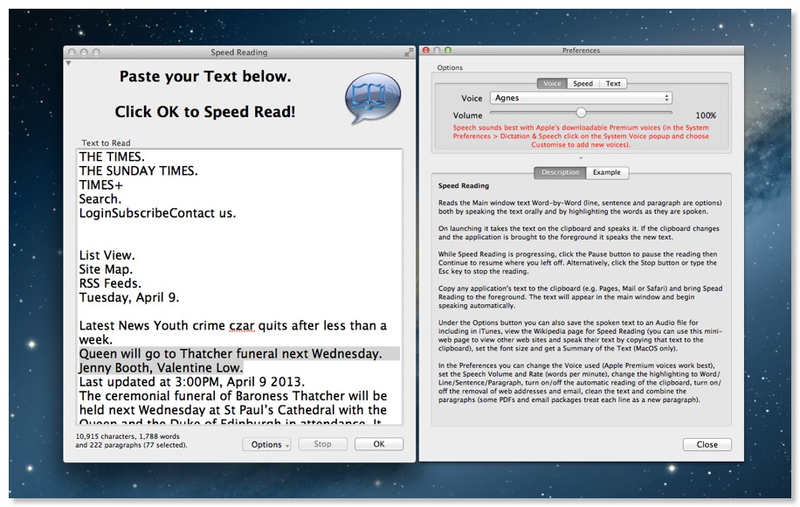 It can work with text from any application including Mail, Pages, Word or Safari. •	Auto-Talk — turn on/off the automatic speaking of the clipboard. 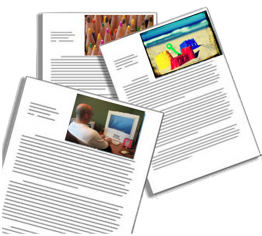 •	Combine Paragraphs — rejoin lines back into paragraphs broken by PDF files or some email packages. 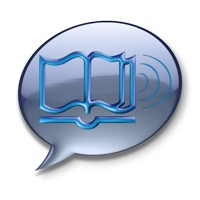 •	Volume — change the Speed Reading Volume, even if different from the normal volume. •	Rate — changes the Words per Minute of the speaking. Note that the speaking must be stopped (not just paused) for the new rate to take effect. •	Audio File — you can save the current text, voice and rate as an AIFF audio file. 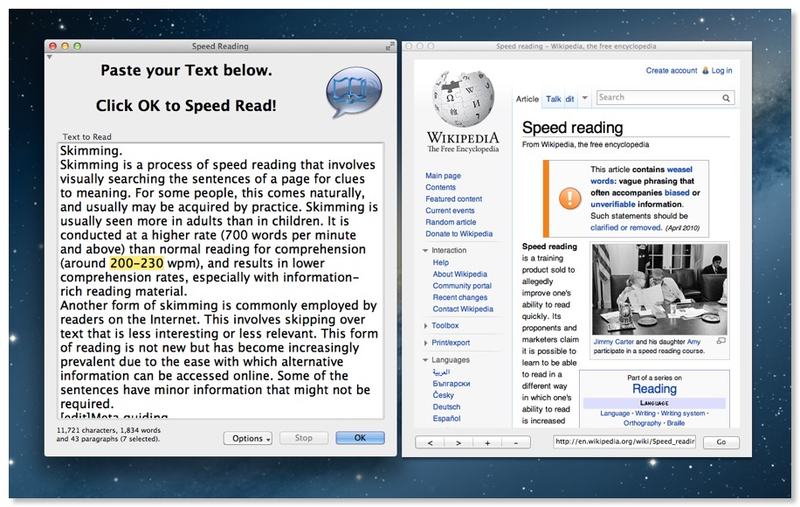 •	Wikipedia on Speed Reading — you can view the Wikipedia web page on Speed Reading from inside the application. •	Talking Web — you can use the same web page window to navigate to other web sites, highlight and speak their text. Speed Reading takes into account accented and foreign characters, but depends on the Voice chosen. [New] There is now a preference to combine paragraphs, for example from truncated emails or text copied from PDF files. 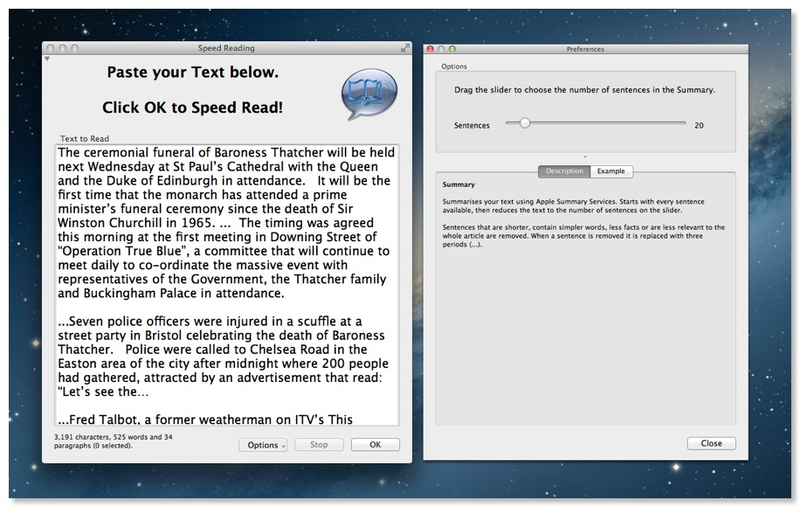 [New] You can now Summarise Text (MacOS only) down to a user-specified number of sentences. 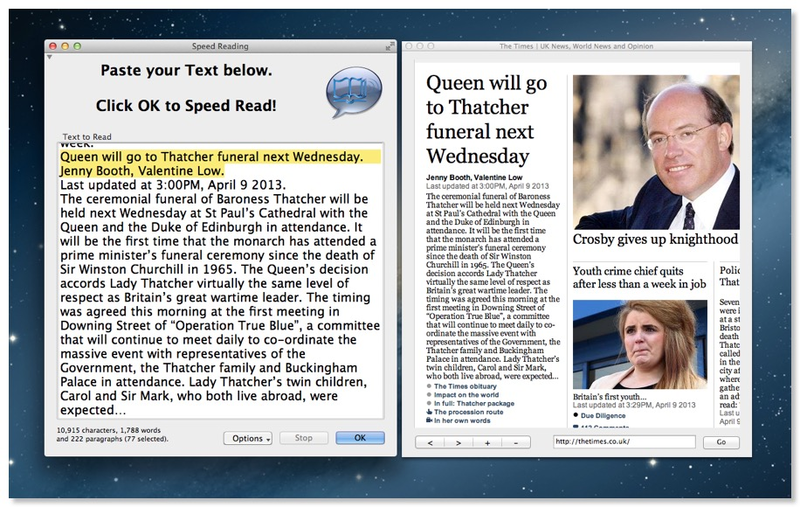 [New] You can now highlight text and have Apple Services perform tasks such as Summarise. 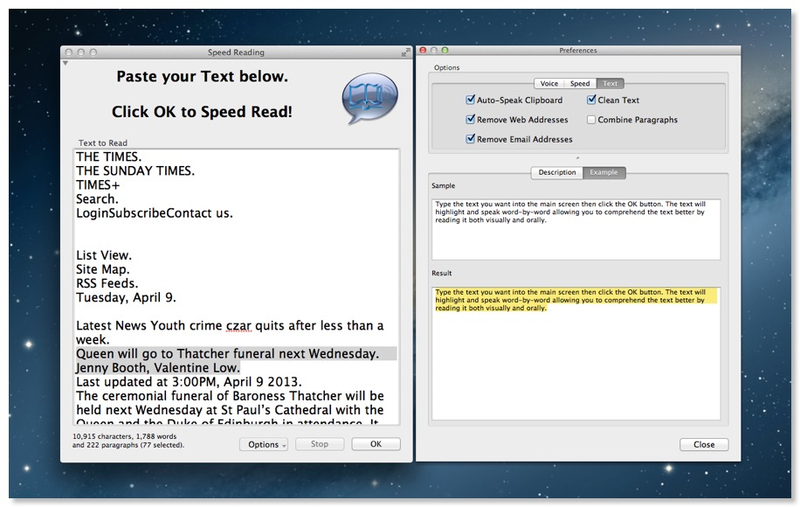 [New] You can now choose to have the spoken text highlighted by Word, Line, Sentence or Paragraph. [New] When the highlighted text is below the visible screen the screen pages down. [New] There is now a preference to remove web addresses. [New] There is now a preference to remove email addresses. [New] There is now a preference to clean the text. This removes excess spaces and returns, plus other edits. [New] Once speech has finished it checks to see if different text is on the Clipboard. If so, it will speak the new Clipboard text. [New] Compatible with Mountain Lion. [Fix] No longer displays some text artefacts when reading new text from clipboard. [Fix] No longer crashes on the last word of certain texts. [Fix] Bringing the application to the foreground while speech is running and with new clipboard text no longer cancels the current speech.